Palestinian Christian worshipers and priests take part in an open-air liturgy to protest the building of Israel’s controversial barrier in the Cremisan Valley. The Cremisan Valley could be called the Valley of Broken Hopes. It lies between the Palestinian city of Bethlehem and the illegal settlements of Gilo and Har Gilo. It has been the center of controversy around Israeli plans to extend the “security barrier” through the valley. The barrier which has been planned for many years, would run down the Cremisan Valley near Bethlehem, severing some 50 Palestinian farming families from their farms, and separating the community of Salesian priests and brothers from that of the Salesian sisters. In addition, the 30-foot-high wall would surround on three sides the school run by the sisters. For a time, it seemed the barrier would not be built. In an apparent victory for the Christian community in the Palestinian West Bank, the Society of St. Yves, a legal aid group of the Latin Patriarchate of Jerusalem, announced on 2 April that the Israeli Supreme Court had accepted the many petitions of Christian groups and rejected the plans to build an extension of the Israeli separation wall in the Cremisan Valley. Those hopes for justice were dashed earlier this month. On 5 August 2015, the Israeli Supreme Court dismissed the petitions to have the wall moved to another place in the valley. Construction of the wall was begun almost immediately. Protests from the largely Christian population in the Valley quickly followed. Some were prayerful and peaceful (such as the one shown above). But others led to violent confrontations with Israeli soldiers. Israeli border guards arrest a Palestinian protestor who was trying to reach tractors working on the construction of Israel’s controversial barrier in the Cremisan Valley. The hospice was established in 2000 for patients with H.I.V. or AIDS, who were untreated or had been turned away by other medical facilities. The AIDS epidemic in India is well-documented. The country has the second largest infected population in the world after South Africa. But for all practical purposes the country acts as if AIDS is not a serious social problem. Ignorance remains common among the public and even some supposed experts. Hospitals and medical staff still routinely turn away patients. When their infection becomes known, people are pushed out of their homes by their communities, sometimes even by their own families. Fear of dismissal or reprisal has forced most to keep their H.I.V. status secret at work and school. In addition, drugs that are immediately available in the West are out of reach due to cost. With nowhere to go, many of the infected take their own lives. At the facility, the patients are glad to see Father Palathingal. His speech, touch and manner reveal real affection and concern. The children often swarm around him like some kind of off-season Santa Claus. One child, Christy, grew so close to the priest that he now lives with him and the sisters at Pope Paul Mercy Home, a nearby facility for the mentally handicapped, also run by Father Palathingal. Christy, an active 2-year-old who insists on going everywhere with the priest, was also at the center of a recent medical controversy. The boy was born H.I.V. positive and was abandoned by his parents. When his status turned negative at around 18 months, his health became the subject of public speculation. Father Palathingal, the sisters and even some doctors credited the Ayurvedic treatment the boy received at the hospice for his negative status. Other medical professionals disagreed, saying such cases are rare but natural occurrences. Read more in “Hoping Against Hope” from the July-August 2004 edition of ONE. The last century or so has not been kind to Armenia or its Catholic minority, who form the Armenian Catholic Church. Sharing the distinct rites and traditions of the Armenian Apostolic Church — while maintaining full communion with the bishop of Rome — this community of faith has contributed considerably to the vitality of the Armenian nation, invigorating monasticism, scholarship and social service even as terror has nearly destroyed it. 2015 marks the centenary of the beginning of the Armenian Genocide. Although large numbers of Assyro-Chaldean and Greek Christians also suffered deportation or death at the hands of agents of the crumbling Ottoman Turkish Empire, the sheer number of Armenians affected astounds. By 1923, as many as 1.5 million Armenians perished. The perpetrators did not make distinctions between Apostolic and Catholic Armenians. Their actions, however, decimated the tiny Armenian Catholic Church. In all, 7 bishops, 130 priests, 47 women religious and up to a 100,000 faithful died. Churches and schools were leveled. And while the post-Ottoman Turkish government distanced itself from the atrocities, the state appropriated abandoned properties and redistributed them to Muslim Turks. Some of those who survived fled to Russian-dominated Armenia. Most survivors, perhaps a quarter of a million people, fled to Lebanon and Syria. There, from their place of exile, they re-established their communities and prospered, that is until war in Syria revisited them. In 1928, surviving Armenian Catholic bishops gathered in Rome, where they agreed to transfer the patriarchate to Beirut. While historically the largest concentration of Armenian Catholics lived in Lebanon and in the Syrian cities of Aleppo, Damascus and Kamichlié, recent statistics provided by the church indicate upward of 400,000 Armenian Catholics living in Armenia, Georgia, Russia and Ukraine. While the tsars impeded the development of all Eastern Catholic communities in Imperial Russian lands, the Soviets were more brutal. In the 1920’s and 30’s, Stalin suppressed all Eastern Catholic churches. In Armenia and Georgia, party members shuttered Armenian Catholic village churches, arrested and shot parish priests and deported religious sisters. The Soviets wiped out all traces of Armenian Catholicism — or so they thought. Catholic Armenians began to surface after a devastating earthquake in December 1988 flattened northern Armenia. And as the Soviet Union dissolved, these Catholics boldly petitioned for their churches to be reopened and for personnel to staff them. The Armenian Sisters of the Immaculate Conception were among the first to respond, sending a team of sisters to work with families and village communities in northern Armenia and southern Georgia. And in 1991, the Holy See created a bishopric for Armenian Catholics in Eastern Europe, but the church is hampered by a lack of priestly vocations. Despite considerable resource shortages, however, the Armenian Catholic Church administers schools, camps and social service centers that offer help to all. 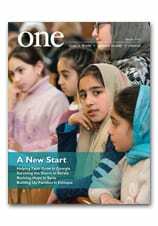 Read a full account of the Armenian Catholic Church from ONE magazine here. Israeli authorities uproot olive trees to build the separation wall near Bethlehem in the Palestinian West Bank on 17 August 2015. To learn more about the controversy surrounding the wall — and the people whose lives will be impacted by it — check out this post. Last weekend, CNEWA attended the New Jersey Catholic Charismatic Renewal Conference in Washington Township, at the gracious invitation of the Rev. Phil Latronico, the conference chair. We were there to spread awareness about the work we do on behalf of Christians throughout the Middle East. Our presence there was especially significant as it was the one-year anniversary of the escape of 120,000 Christians from the Nineveh Plain, as they fled the violence and terror of ISIS. My colleague, Norma Intriago, had the chance to address the conference during Saturday’s liturgy. She spoke movingly about those who are caring for the displaced Christians — people like Sr. Maria Hanna, OP, the Prioress of the Dominican Sisters of St. Catherine of Siena. She — along with 72 of her sisters — also fled the Nineveh Plain last August to the safety of Erbil, in Northern Iraq. There, with CNEWA’s help, the sisters immediately began ministering to their fellow displaced, providing emergency aid, healthcare and education. As our visit was on the Feast of the Assumption, Norma also spoke of a story she heard from one of CNEWA’s church partners, of a mother and her four children, who fled ISIS in Syria for the safety of Lebanon. Unable to continue, she made an impossible choice — to leave her two youngest behind in the mountains so she could carry the rest of her family away from harm. Who else could comfort her and so many other mothers but Our Lady of Sorrows, who hears the prayers of so many who are desperate for help? Norma concluded by asking for support and prayers for all those suffering in the Middle East, and especially for the caregivers like Sr. Maria Hanna, who face their own adversity and struggles while ministering to children and families in need. The response by those at the conference was incredibly uplifting, and we’re so thankful for the new friends we made. In just a few hours, we were able to raise over $1,000 for those caring for people in some of the most troubled parts of the world. We’re especially grateful to Father Latronico, for his wonderful welcome and continuing support. If you would like us to visit your parish or prayer group, please contact Norma Intriago, our development director, at nintriago@cnewa.org. Bodies of Syrians are seen after Assad regime forces bombed a marketplace inside residential areas in Douma Town of East Ghouta region of Damascus, Syria on 16 August 2015. "The Separation of Peoples Will Not Contribute to Peace"
After years of debate and dispute, the Israeli Supreme Court last month ruled to allow the building of a separation barrier through the historic Cremisan Valley. Following a series of international appeals, the court in April blocked plans by the Israeli military to extend the wall through the valley which is home to two Salesian monasteries and a convent school. Under the latest court ruling, those religious buildings will remain on the Palestinian side of the wall, accessible from the town of Beit Jala, while land belonging to 58 Palestinian families will be cut off on the Israeli side of the wall. While Israel claims the construction of the barrier is necessary for security reasons, Palestinians say the move is aimed at confiscating fertile land for the expansion of two Israeli settlements. We believe that peace can only be achieved by seeking justice for all. The separation of peoples through walls and barriers can only further divide and anger people and will not contribute to peace. We call on all leaders in the Holy Land to work for peace by seeking justice, and to show mercy and compassion to one another. We express our solidarity and support for the Patriarch of Jerusalem, His Beatitude Faoud Twal, his auxiliary bishops, and all the suffering peoples of the Holy Land. Furthermore, we hold all people of the Middle East in our hearts and prayers. We continue to pray for them. Just this morning, CNEWA received word that the Israeli Defense Force arrived in the valley and, in preparation for the construction, began destroying olive trees belonging to five Palestinian families from Beit Jala. Meantime, The Society of St. Yves has submitted a new petition to Israel’s High Court, seeking to have the whole planned route of the Separation Wall revealed before construction begins. You can read more history and background on the wall here and here. Children attend a class in traditional Arab dance at the Centro Social Hondureño árabe. The Centro Social Hondureño árabe is Honduras’s largest and most opulent country club, boasting tennis courts, a fitness center, sushi bar, disco and other luxuries rare in this country that is one of the poorest in the hemisphere. But for all its glitter, the club’s chief distinction, suggested by its name, is that it was founded by and primarily for the country’s small but prosperous Arab-Honduran community. “The community has always looked for forums to socialize, to maintain our bond, and this club is a consummation of that feeling,” said Lidia Abouid, the club’s supervisor. On a recent summer day, only a couple of miles from the urban din of San Pedro Sula, Honduras’s city of industry, scores of children could be found paddling in an Olympic-sized pool, cooling off after a morning of tennis and racquetball. The voice of the Lebanese chanteuse Fayrouz wafted over the grounds as the staff tidied the club’s three banquet halls: the Palestine, the Jerusalem and the Bethlehem. Today, there are as many as 220,000 Arab-Hondurans. While they represent only 3 percent of the total population of 7.3 million people, they have had an outsized influence on the nation. They are most visible in business and only slightly less so in politics. Centro Social’s president, Juan Canahuati, a textile magnate with numerous other entrepreneurial activities, is considered the country’s top businessman. Coffee exporter and former Industry and Commerce Minister Oscar Kafati’s ancestors immigrated to Honduras in the late 19th century from Beit Jala, a Christian town adjacent to Bethlehem. Former President Carlos Flores Facusse’s mother came from Bethlehem. Arab immigration to Latin America is not unique to Honduras nor are such success stories. To take just two prominent examples: former Argentine President Carlos Ménem (1989-1999) traces his roots to Syria; Mexico’s telecommunications titan, Carlos Slim Helu, the world’s third richest man, is of Lebanese descent. Nearly all Arab-Hondurans claim Christian Palestinian origins, making the Arab-Honduran experience unique. Proportionally, there are more people of Palestinian descent in Honduras than any other Latin American country. Arab Palestinians first came to Honduras in the 19th century, but the largest waves arrived after 1896, the year the Ottoman Turkish Empire, which then controlled Palestine, first allowed emigration. Numerous factors motivated the early emigrants. In 1909, the Ottomans included in the military draft Christians and Jews, who were once forbidden to serve, but required to pay tribute instead. Economic incentives also drove Arabs abroad. Tourism and commerce, areas in which many Christians worked, declined during World War I. And increasingly Palestine’s Arab Christians found themselves competing with the growing Jewish population, largely secular Zionist immigrants from Europe, in their entrepreneurial activities. Just as today, there seemed to be more opportunities for enterprising Arabs abroad. Read more about “Middle Eastern, Central American Style” in the September 2006 edition of ONE. Recruits of the Azov far-right Ukrainian volunteer battalion take their oaths during a ceremony in Kiev, on 14 August 2015. Two people were killed in another round of intense shelling between Western-backed Ukrainian government’s forces and pro-Russian fighters in the separatist east. Ukraine’s military spokesman Andriy Lysenko said one soldier was killed and six wounded in the past 24 hours of fighting across the mostly Russian-speaking war zone.